I guess I like origin stories. And not just in comic book movie form, but across the cinematic board. Think about it; so many amazing films, and stories for that matter, are just the tale of how things came to be. And if you wanted to get even broader, that’s what religions & myths are as well; explanations of the origins of the things we can’t understand. So take a fictional character, show us his background, and we’ll eat it up, or at least I will. Braveheart, Star Wars, Forrest Gump; we meet our hero, watch him grow, see his mistakes, and ultimately root for his success. It’s no surprise that comic book origin stories are so strong then, since they’re simply following the recipe that has been laid down by so many other films and banking on the fact that we inherently want to know why. Steve Rogers was just another brave, young man who wanted to serve his country. So when WWII began, he immediately went to enlist. Problem was, Steve didn’t have an athletic or healthy bone in his body. Rejected time & time again, Steve would eventually resort to a secret government project meant to change an average solider into a super soldier, into a beacon of hope for the troops. That’s how little Steve Rogers became Captain America, but that’s not where the story ends. What began as an experiment to create an unbeatable army became a sideshow meant to draw support, but the process forgot the man involved, forgot that he had the power to decide his own fate. 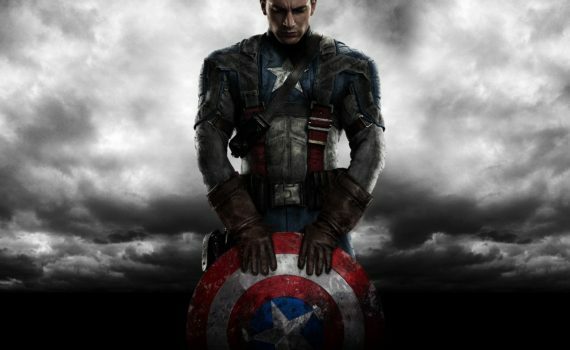 And what Cap decided was to fight with his brothers, to stand when others fled, to become a symbol of freedom worldwide. It’s the origin story formula that gets me every time. It got me in Batman Begins and it got me here. We get to see the hero before he’s super, the man before he’s a god, the kid when he’s still dreaming. Steve makes mistakes, makes friends, makes enemies, and ultimately makes the choices that will set him on the path we already know so well. It’s the perfect way to become introduced to a comic you might not have read, and the film itself does the comic justice. Chris Evans is the perfect Cap, with Hugo Weaving as excellent Red Skull. Even the side characters were strong; Atwell, Sebastian Stan, Tommy Lee Jones, Stanley Tucci, Toby Jones. I did think the little group of core army members who fought alongside were a bit ridiculous, but then they were quickly here & gone. First Avenger has what we want; a time capsule feel, cool action, interesting characters, and it stays grounded in the point, that the adventures of Captain America are just beginning.